E-commerce is the way of the future, increase sales, work less, expand your market place and increase your revenue. Commonly business owners use E-commerce platform and ERP system distinctly, making silos of information and they fail to benefit from an integrated system. You can get numerous advantages by getting the E-commerce data directly from your ERP system without any human interaction. Swash provides cloud based E-commerce solution “KenCommerce™”. This is the solution simplifies tasks associated with E-commerce, like shopping cart and billing. Features of this cloud based ERP integration is to enhance the inventory control with correct and updated stock updating of the online store which leads to minimize the manual process. With this process service, E-commerce website eliminates the re-entering process which further allows you to have more accuracy in finance and other business processes. KENCommerce™ is one of the best products used by most profitable industries in terms of earning higher revenues and turnovers than other industries. It helps managing the inventory, logistic, store management, customer service, sales distribution, production, point of sales, finance. KENCommerce™ helps contributing overall profitability and success to the business. It also helps to estimate or forecast sales in the store. It analyses various auto generated detailed reports. To get more details about our KENCommerce™ product, please click here. 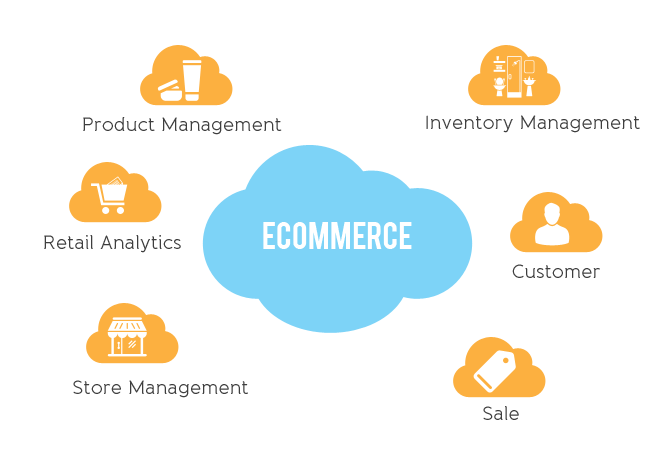 KENCommerce™ can also be fully integrated with an E-commerce webstore. It has pre-built ERP E-commerce integration with a variety of E-commerce platforms. Key data is synchronized 24/7 between both systems with an E-commerce platform seamlessly integrated to your ERP. This improves customer relations, maximizes profits and reduces the time spent managing data entry in two systems. On to the store front, the availability of real-time data from the ERP system allows customers to track shipments with tracking numbers, latest order status and view available inventory. This improves customer experience with your store front and helps in reducing your cost of operations. Payment & shipping information, web orders, and web customer details will be integrated to ERP system with integration, similarly inventory and item details can be uploaded from KENCommerce™ to E-commerce portal, so this integration will eradicate the requirement of reentering the data. Thus the integration solution will reduce data redundancy, human involvement and error over two platforms. Incorporation of E-commerce and ERP business processes provides the business owners with a better control of their business and there by getting competitive advantage. KENCommerce™ provides comprehensive solutions for E-commerce business. Here are some of the important features of our E-commerce business solution. This feature helps with better product management, better customer service, more accurate estimations, more flexible production planning and easier collaboration. With advanced product information management functionality it can centralize and create accurate data on the fly. Through automatically updated stock levels, inventory management feature improves inventory control whenever purchases and sales are made. This also facilitates you to manage inventory across multiple locations and warehouses. Customer management feature of KENCommerce™ helps you manage your customers effectively. You can streamline your customer-related processes toward being more customer-centric. This feature facilitates you to automate your sales force and certainly upsurge your conversion ratios from leads to sales, which boosts your profitability. It also helps to manage various sales related tasks in a well-planned manner. This particular feature can be an invaluable option for you and your business to keep organized and running at the highest level. This helps you with inventory analysis, store stock adjustment, tracking opening stock and many more.